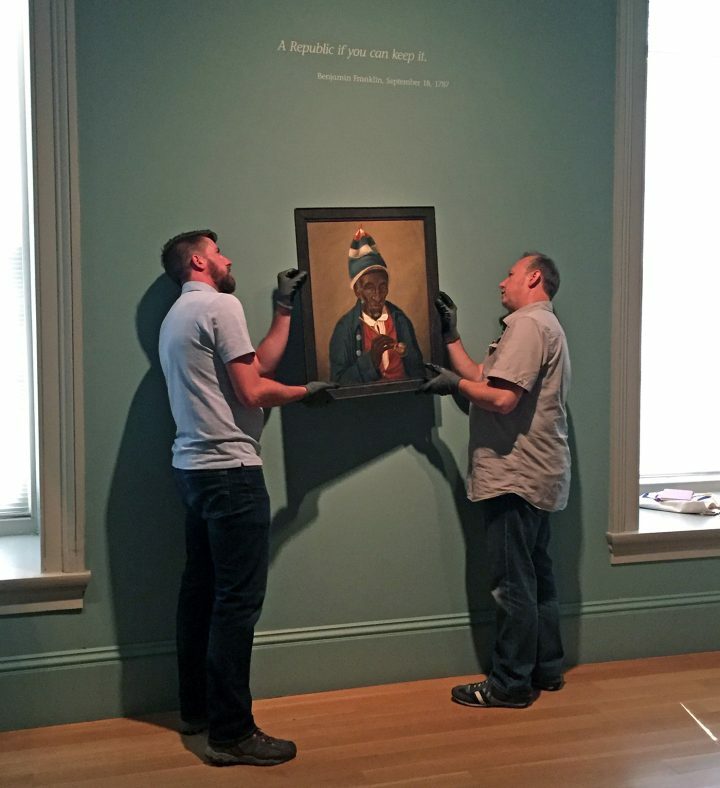 The Smithsonian National Portrait Gallery is showing an 1822 painting of Yarrow Mamout, a Muslim native of Guinea who was forced into slavery in America. A portrait on loan to the Smithsonian’s National Portrait Gallery (NPG) will probably challenge many people’s understanding of early American history, particularly in regards to the presence of Muslims during that formative period. The small 1822 canvas, painted by James Alexander Simpson, is one of two known portraits of Yarrow Mamout, and his story is pretty amazing. Born in 1736, Mamout hailed from one of the nomadic West African groups that spoke Fulani. Like many Africans during that time, he was forced into servitude and delivered to the shores of the Americas from his native Guinea through a network of slave traders. The passage turned the freed African into a minor celebrity, while sharing the story of his financial hardship. After Mamout was freed, he worked to save $100. He deposited his savings with a white merchant for safekeeping, but after the man’s death, the money was lost. Mamout tried again, and after he was able to earn another $100, he deposited it with another merchant; again, his hopes were dashed as the money was lost when the man filed for bankruptcy. Finally, Mamout tried a third time, saving $200. Thankfully, he was convinced by a friend to invest his fortune, and he proceeded to purchase bank shares in his own name. His smart investment worked, and he was able to buy his own log home (now demolished), where he had a garden that he would pray in, turning toward Mecca. While Mamout spoke English poorly, he did speak and read Arabic, and he was remembered as a devout Muslim. The painting at the NPG is on loan from the Georgetown Branch of the District of Columbia’s Public Library system. It was painted by James Alexander Simpson, Georgetown University’s first art instructor, after he heard that Mamout may have been a centenarian (we now know he wasn’t quite there yet). For the same reason, the more famous American artist Charles Willson Peale — best known for his portraits of George Washington — also painted Mamout in a portrait that’s now part of the collection of the Philadelphia Museum of Art. Of course, Mamout did not have the same legal standing as other Americans during his life. Not being white meant he was not allowed to vote and was robbed of any of the rights of US citizenship — though even if black men had been allowed to vote, Mamout would still have faced difficulties, as Muslims were routinely denied entry to the US and citizenship until the second half of the 20th century. His incredible story testifies to the contradictory attitudes toward slavery, Africans, and Islam in the early years of the American Republic, as well as the fact that Muslims have been part of the American story since day one. For those interested in learning more, James H. Johnston wrote a comprehensive history of Mamout and his family in From Slave Ship to Harvard: Yarrow Mamout and the History of an African American Family.